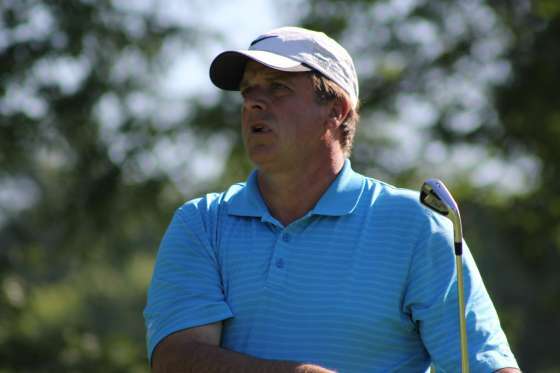 SOUTH LYON – Jackson’s Steve Maddalena admitted to a few nerves as he turned back Donald Simmons of Northville 3 and 1 to win the 8th GAM Senior Match Play Championship presented by Sullivan Golf Travel.com Friday at Walnut Creek Country Club. “I was a little nervous because I haven’t been in that position in a while,” the three-time Michigan Amateur champion and Michigan Golf Hall of Fame member said after accepting the Jerry Walker Trophy. It was the first senior win for the 56-year-old senior account executive for Kentwood Office Furniture in Jackson, and the first state title since he won his third Michigan Amateur in 1995 to go with titles in 1980 and 1990. George Dillon of Midland won his second Super Senior Division title in the tournament. The 68-year-old, who is retired from Dow Chemical, also won in 2013. This time he turned back Dave Kempner, a 68-year-old Ann Arbor attorney, 2-up in the title match. Maddalena, who had back surgery at age 49 and has been forced to change his swing to compensate, said the guys at Country Club of Jackson might quit picking on him for hitting so many practice balls on the range. He was solid on the course through the week, turning back Glenn Murray of Bingham 1-up, Mark Mann of Ann Arbor 5 and 4, Michael Parker of Lapeer 1-up, fellow Jackson golfer Pete Walz 1-up in a semifinal match and finally Simmons. Simmons, 62, an HVAC contractor and member of Western Golf & Country Club, said he had a great week. Dillon called his Super Senior final match with Kempner scruffy golf. Kempner, who also finished second in 2014 in the Super Senior title match to Michael Phillips, said he wished he had played better. Dillon started match play on Wednesday with a 3 and 2 won over John Thrasher of Sarnia 3 and 2, topped John Lindholm of Grand Blanc 4 and 3, beat Pete Saputo of Bloomfield Hills in 20 holes in a semifinal and then turned back Kempner.